Saving this loaf from ordinary cinnamon-nut status is freshly ground black pepper: the piquant note balances the cinnamon’s sweetness, making the bread a good foil for egg salad, thinly sliced ham, or herbed cream cheese. 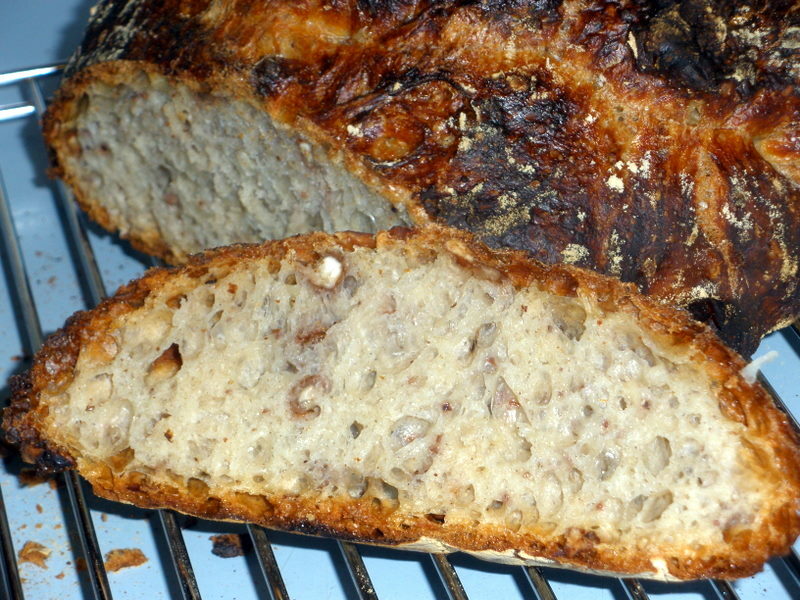 As I keep baking these variations on the no-knead loaf, I’m warming to the high-hydration dough’s wonderful ability to accomodate any sort of improvisation. 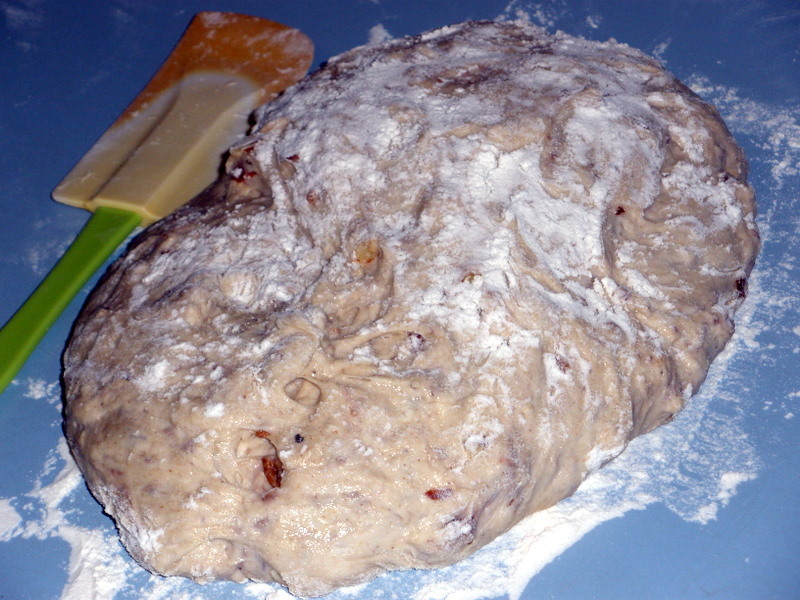 So far, flour substitutions, liquid changes (kind, not amount), flavoring additions (nuts, raisins, olives, chopped herbs), or textural amendments (ground flaxseed, lightly crushed rolled oats, wheat germ)–the ultra-wet dough absorbs it all and still manages to rise high. 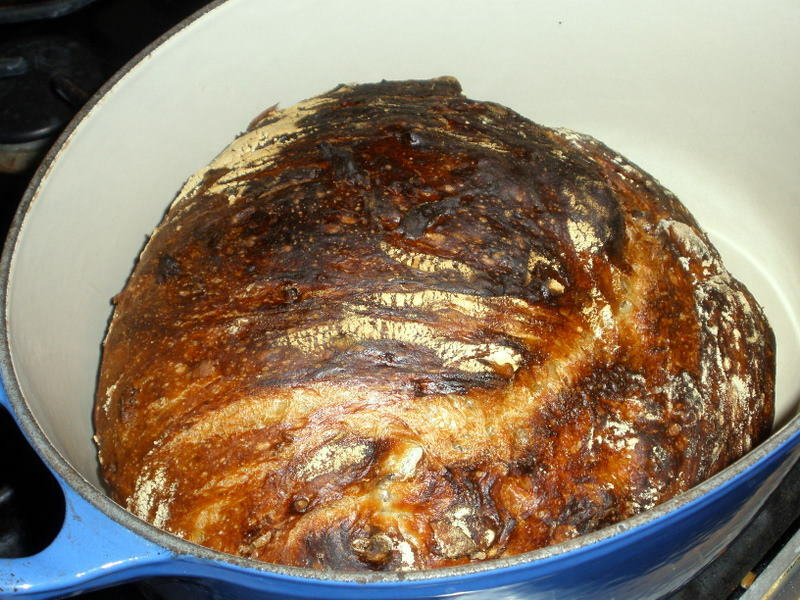 Another thing adjustment to the original no-knead technique I learned along the way: a slightly smaller enameled cast-iron pot (Lahey suggests 4-1/2 to 5-1/2 quart) produces a better-textured loaf than a slightly larger one. I have a 3-1/2 quart val, and a 7 quart round; the oval results in a slightly torpedo shaped loaf that’s easier to slice than the flatter round from the larger pot. I’m also slashing the loaf tops immediately before placing the dough in the oven: it makes for a more evenly shaped loaf. In a large bowl, stir together all ingredients except the water until blended. Add the water and stir until a wet, sticky dough forms; stir an additional 30 seconds. Cover bowl and rest at room temperature for 12-18 hours, until the surface shows bubbles and dough is more than doubled. Generously dust work surface with flour and scrape dough in one piece from the bowl. Gently shape into an oval shape (if using an oval pot) or a round. Cover with a non-terry kitchen towel and allow it to rise a second time for 1 to 2 hours, or until it has almost doubled. Dough is ready when it does not spring back when poked. At least 30 minutes before the end of the second rise, preheat the oven and a lidded, 3-1/2 quart oval enameled cast iron pot to 475 degrees. When dough is doubled in size, remove the pot from the oven, uncover, and carefully place the dough into the pot. If desired, quickly slash two or three end-to-end cuts atop the dough, using a razor blade. Cover the pot, return it to the oven, and bake for 30 minutes. Remove the lid, and bake an additional 15 to 30 minutes, until the crust is deeply colored but not burned.